Home » Car Buying Tips and News » Order your 4 Series now! Order your 4 Series now! 2014 BMW 4-series Cabriolet Photos and Info – News – Car and Driver. While the existence of the 4-series convertible is no surprise, the fact that BMW had the audacity to actually go through with calling this breathtaking droptop a 4-series—when the two-door 3-series had cultivated such a fondness among consumers and the media alike—still has us slightly befuddled. Acceptance of the name change should be accelerated by the fact that there is little else that needs getting used to. The 4-series convertible is derived from the 4-series coupe, which we have driven, analyzed, and awarded a stamp of approval. The 4-series cabrio has become a more generously proportioned car, massaged to provide comfort and luxury without sacrificing the dynamic abilities for which BMW is known. The Bavarians admit the car is “visibly larger in width, track, and wheelbase” than its predecessor, and it’s taller, too, if ever so slightly. Despite its growth, the 4-series convertible is slightly lighter than the car it replaces, as BMW says it managed to shave off up to 45 pounds. Top: 2013 BMW 335i convertible. 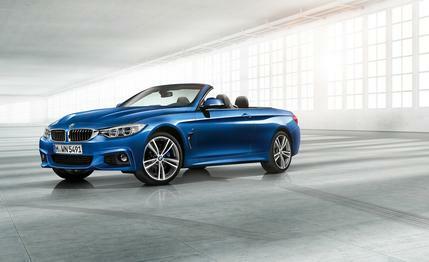 Bottom: 2014 BMW 435i Sport Line convertible. The 4-series convertible will launch with two gasoline engines: The 428i is fitted with the N20 2.0-liter four-cylinder, and the 435i comes with the N55 3.0-liter straight-six. Both engines are direct-injected and turbocharged. The 428i is rated at 240 horsepower and 255 lb-ft of torque; BMW says that it will accelerate from a standstill to 62 mph in 6.4 seconds, and top speed is likely to be governed at 130 mph. This engine replaces the old, naturally aspirated straight-six that was a favorite in its predecessor. The four-banger is more efficient and torquey than the outgoing unit, but that naturally aspirated six was one of the smoothest and most pleasant engines ever to spring from the drawing table at Bayerische Motorenwerke. The power-hungry will opt for the 435i, which is rated for 300 horsepower and 300 lb-ft of torque. It will hurl the heavy convertible to 62 mph in just 5.6 seconds, and it tops out at a governed 155 mph. Both engines can be mated to a six-speed manual or a ZF-sourced eight-speed automatic. BMW has continued the use of a folding hardtop even though many competitors have reverted to cloth tops, which now not only match the insulation and protection of retractable hardtops, but are also less complex to integrate and leave a lot more trunk space—not to mention the weight savings of fabric versus metal. But there are customers out there—particularly those who can afford only one car—who believe that the hardtop is a better year-round solution. It is more than a carry-over piece of engineering, however, as BMW has improved the acoustic insulation properties of the roof. Under the skin, the 4-series convertible rides on struts up front and a multilink setup at the rear. Electric power steering helps to keep fuel consumption down, but doesn’t do miracles in terms of road feel. The good news for BMW is that most customers won’t ever notice that the firm has all but abandoned hydraulic power steering—and those that do most likely won’t consider it a disadvantage anymore.